UAE-headquartered hospitality company Time Hotels Management, has achieved Green Key status for all of its hotels and hotel apartments across the hospitality groups’ entire portfolio. A leading international standard of excellence in the field of environmental responsibility and sustainable operation within the tourism industry, the Green Key award is a voluntary eco-label that represents a commitment by hospitality and tourism establishments to adhere to the strict criteria as stipulated by the Emirates Green Building Council (EGBC). To qualify for the award, Time hotels had to pass an exhaustive audit, which recognised its contribution towards eco-friendly programmes, such as energy and water-saving initiatives, as well as waste management projects, all of which help to reduce Time’s carbon footprint, limiting its negative effect on the environment. Time Oak Hotel and Suites, Time Grand Plaza Hotel, Time Ruby Hotel Apartments, Time Opal Hotel Apartments, Time Topaz Hotel Apartments and Time Crystal Hotel Apartments were all successful in the latest round of Green Key assessments. 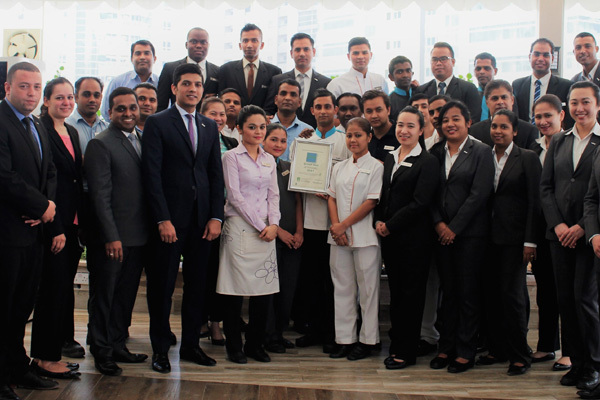 The annual Green Key award also promotes awareness and encourages the creation of behavioural changes in guests, staff and suppliers, as well as applauding increased use of environmentally-friendly and sustainable concepts and applications within hotel operations. The audit addressed 12 key areas, which not only covered energy-saving, water conservation, waste management systems and the indoor environment, but also staff involvement and guest awareness. Improvements of between 5 per cent to 10 per cent had to be achieved, before certification would be renewed. Beyond Green Key, Time Hotels has previously participated in the EEG Can Collection Campaign, with a total of 14 kilograms/4,500 cans collected over a period of two months. The company also launched the Time Urban Garden project, located at Time Oak Hotel & Suites in Al Barsha Heights in Dubai. The project is designed to provide better nutrition and health for the community and educate people of all ages about the upkeep and care of a living garden. And earlier this year, Time Hotels partnered with SGE UAE to introduce a new corporate initiative aimed at restructuring engineering across its GCC properties. The engineering solution, which provides a central point for procurement and purchasing, tracks all maintenance work carried out throughout the Time Hotels portfolio of properties.